Frequently the area around airports has always seemed desolate, without a nice place to wait for someone to arrive except for the shoulder of an off-ramp (especially in Philadelphia). Maybe I've not had much luck in my travels but it seems a watering hole would do well to spring up within five minutes of baggage claim. It wasn't until recently that my wife and I stumbled upon our first real example of a near-airport oasis so long winded-ly dubbed Professor Java's Coffee Sanctuary. 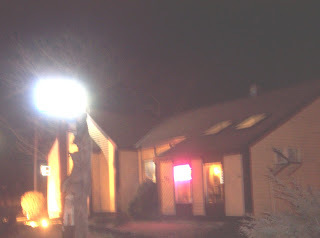 The stand-alone coffeehouse happened to not only be located near the Albany airport, but also right across the street from a few airport hotels. With very convenient parking in the rear, we made our way in the rear entrance into what appeared to be a converted house. The many rooms with ever so many colored walls and various furniture made for a very eclectic and slightly warm interior. The interior also had enough room for three counters; one for free leaf tea, one for whole bean coffee, and the third for the cafe items (which seemed a little disheveled and messy). The coffee is roasted in-house (there's a drum roaster in the back) and the professor boasts a decent-sized selection. I had a cup of Monsoon Malabar which sampled smooth with an elegant bright sweetness. The espresso on the other hand was a little rough and sharp, though not bad. The tea is free leaf. All in all, I'd have to say I was mildly impressed. Professor Java's definitely has the location down and fairly decent drip coffee, but it seems they could do a whole lot more with their products and presentation. I'm no business guru, but a coffeehouse with long hours near a big airport only has areas to improve. Hello, I really like the way you express your ideas. But I have troubles with adding you to my bookmarks. I think I'll bookmark your blog, as it brings a lot of new great and useful ideas and sollutions!